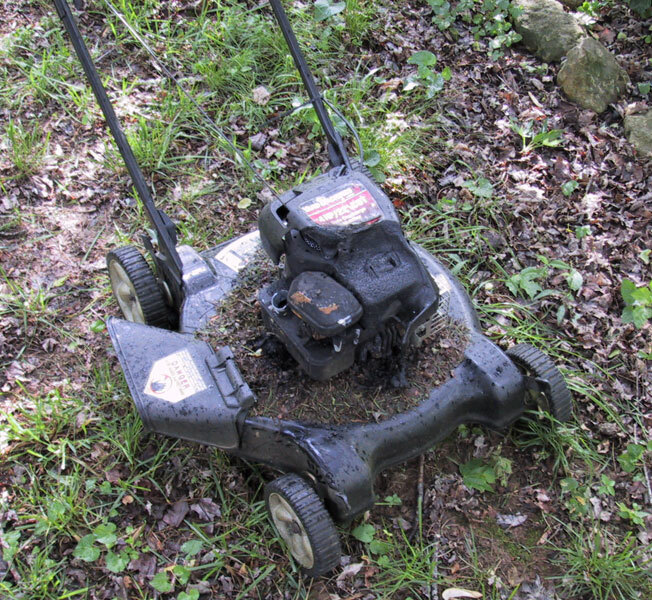 As luck would have it, our lawnmower caught fire yesterday. It’s probably my fault. Nobody got hurt in the accident, but the lawnmower is now only good as a conversation piece. Yes, yes. Real flames, and I put it out with a hose. My daughter was pushing it at the time. Some parents spank, others ground their kids. Me? I opt for the flaming yard equipment. The smell of burning gasoline tends to stay with a child and bring your point right home. Seriously, though, the whole episode scared the living crap out of me. The 20 seconds or less of my screaming, “Oh my God! Get away from it, Charlotte! It’s on fire!” seemed to last an eternity. The kid never noticed the fire or me screeching like a banshee until I was right up in her face. We still don’t know what caused the fire. I did spill a little more gasoline than usual when filling the tank, and there was some dry grass on top of the mower. It could have been that, I suppose. It could have been that the gas line came loose or the gas cap wasn’t on tight enough. All I know for sure is this: I need a babysitter. It’s not safe for me and Charlotte to be left alone. We get into mischief every time. I had meant to tell you today about my potato salad misadventure, but that story lost out to the story with danger. It’s like “Star Wars” playing alongside, I dunno, “Fried Green Tomatoes” – the food story will wait for video. Deb, I know Char is a little too witty sometimes. This might just be the grandma in me talking, BUT I dont think you should let a child use yard equipment that is on fire, no matter how smart-mouthed they are.